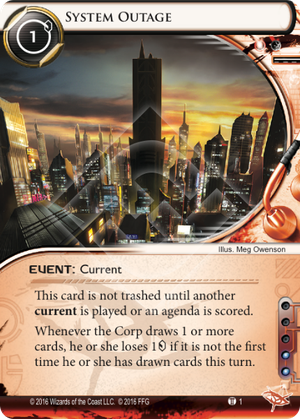 Whenever the Corp draws 1 or more cards, he or she loses 1credit if it is not the first time he or she has drawn cards this turn. 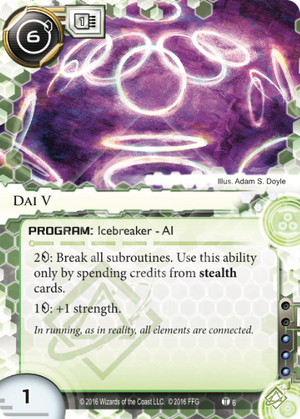 Once per turn, when you encounter a piece of ice, you may trash 1 card from your grip. If you do, that ice has -2 strength for the remainder of this run. Whenever you approach a piece of ice, you may expose it. 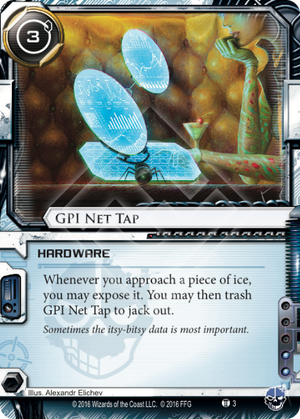 You may then trash GPI Net Tap to jack out. Sometimes the itsy-bitsy data is most important. 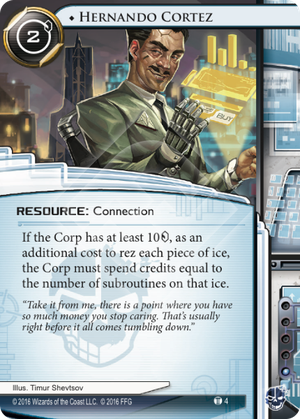 If the Corp has at least 10credit, as an additional cost to rez each piece of ice, the Corp must spend credits equal to the number of subroutines on that ice. "Take it from me, there is a point where you have so much money you stop caring. That's usually right before it all comes tumbling down." 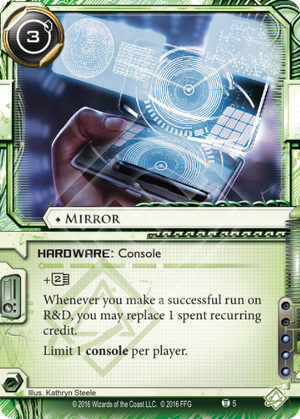 2credit: Break all subroutines. 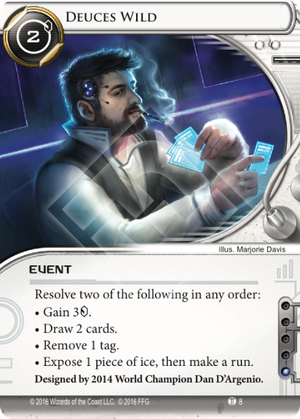 Use this ability only by spending credits from stealth cards. 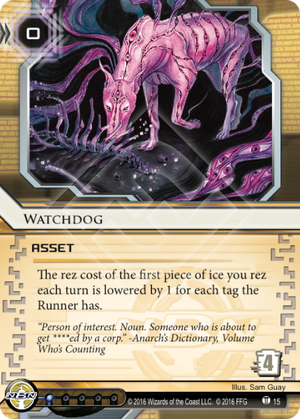 In running, as in reality, all elements are connected. 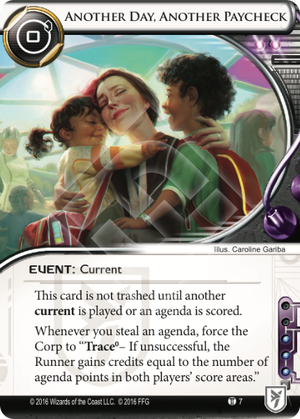 Whenever you steal an agenda, force the Corp to "Trace – If unsuccessful, the Runner gains credits equal to the number of agenda points in both players' score areas." Expose 1 piece of ice, then make a run. Make a run and choose an icebreaker. 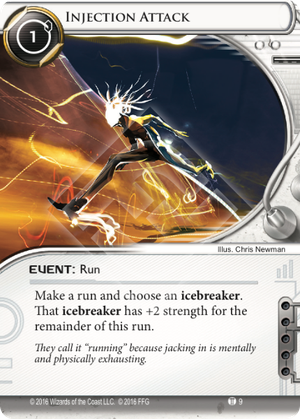 That icebreaker has +2 strength for the remainder of this run. They call it "running" because jacking in is mentally and physically exhausting. 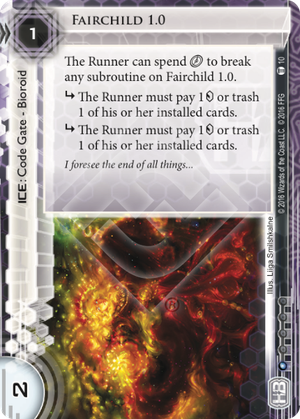 The Runner can spend click to break any subroutine on Fairchild 1.0.
subroutineThe Runner must pay 1credit or trash 1 of his or her installed cards. 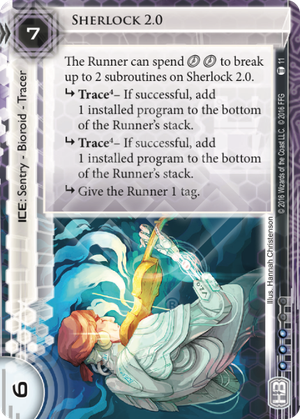 The Runner can spend clickclick to break up to 2 subroutines on Sherlock 2.0.
subroutineTrace – If successful, add 1 installed program to the bottom of the Runner's stack. 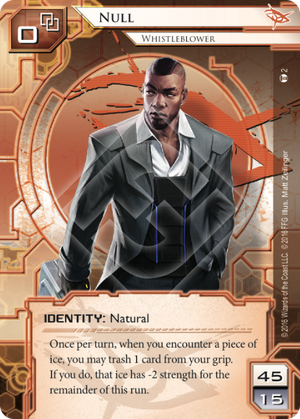 subroutineGive the Runner 1 tag. 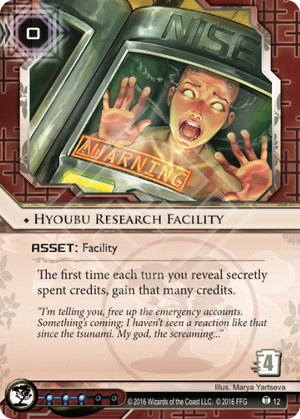 The first time each turn you reveal secretly spent credits, gain that many credits. "I'm telling you, free up the emergency accounts. Something's coming; I haven't seen a reaction like that since the tsunami. My god, the screaming..."
Whenever the Runner makes an unsuccessful run on this server, do 1 net damage. 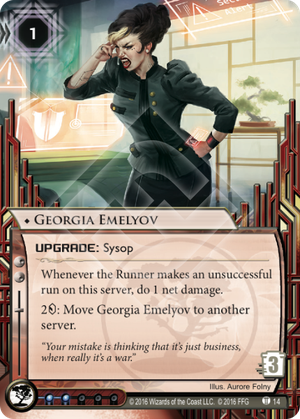 2credit: Move Georgia Emelyov to another server. "Your mistake is thinking that it's just business, when really it's a war." After you resolve this operation, end your action phase. 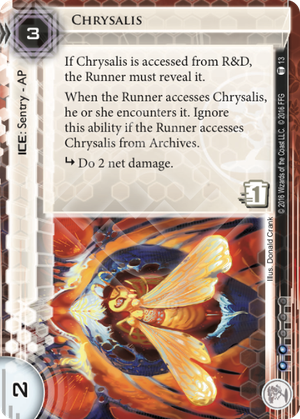 Play only if the Runner made a run during his or her last turn. 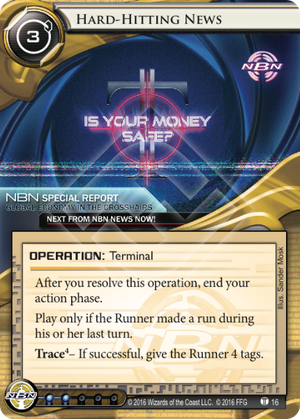 Trace – If successful, give the Runner 4 tags. 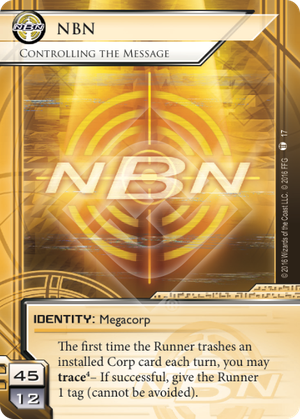 The first time the Runner trashes an installed Corp card each turn, you may trace – If successful, give the Runner 1 tag (cannot be avoided). 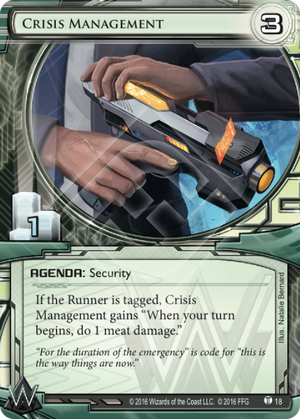 If the Runner is tagged, Crisis Management gains "When your turn begins, do 1 meat damage." "For the duration of the emergency" is code for "this is the way things are now." 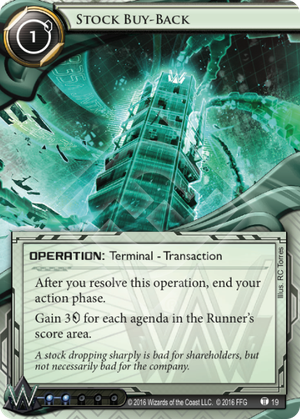 Gain 3credit for each agenda in the Runner's score area. A stock dropping sharply is bad for shareholders, but not neccessarily bad for the company. 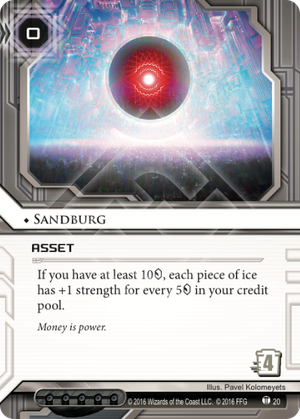 If you have at least 10credit, each piece of ice has +1 strength for every 5credit in your credit pool.